"...Director William Osetek has staged his Broadway-quality (but very much Chicago-style) "Gypsy" as a vaudeville show itself; the dominant scenic element in Martin Andrew's fine design is a spinning gold proscenium. It is not a wholly original idea, but it executed exceptionally well, albeit a tad underpaced in some transitions on Thursday's opening. Thanks especially to the knockout Cheryl Avery, who plays the stripper Mazeppa, and Matthew Crowle, a skilled tapper and a just-selfish-enough Tulsa (the resonant choreography is by Tammy Mader), the famous specialty numbers deliver a great bang for the buck. (A bevy of talented kids also are part of that.)" "...Andrea Prestinario is beautifully understated and real as sweet, bookish Louise, the long-ignored daughter who surprisingly morphs into the happily glamorous Gypsy Rose Lee, and finally finds the steel to stand up to her mother. David Kortemeier captures the essence of Herbie, the meek but self-aware man who loves Mama Rose until she goes one step too far. Matthew Crowle stops the show as Tulsa, the boyish tap dancer. The kids who line up for a patriotic workout in Mama Rose’s endlessly recycled vaudeville act are priceless. And for sheer hilarity there are the three strippers played to vintage perfection by Susan Lubeck, Cheryl Avery and Frances Asher. They sing “You Gotta Have a Gimmick,” but as this electrifying production proves, what you really need is immense talent and absolute truth." "...As Mama Rose, Klea Blackhurst evokes the spirit of Ethel Merman, who originated the role, without slavishly imitating her. And Andrea Prestinario just shines and shines as Gypsy, the shy mouse who becomes a roaring lioness." "...Curtain up! Light the lights! Director Bill Osetek has worked magic with another American musical classic. Revered as more than simply a song-filled biography of stripper Gypsy Rose Lee, Arthur Laurents/Jule Styne/Stephen Sondheim’s musical is also a page out of theatre history, from Vaudeville to Burlesque. And, along the way, some of Broadway’s most memorable characters come to life, not the least of which is Mama Rose, the prototype for all stage mothers. And in Osetek’s production, it’s the characters who stay with you, long after the final curtain." "...Still, a Gypsy that skims the surface is better than most shows, thanks to Jule Styne’s brassy score, Stephen Sondheim’s witty lyrics and Arthur Laurents’s satisfying book, which improves on the factual record. William Osetek’s staging fares best with the musical’s comedy and moments of straightforward razzmatazz, as in the family’s wonderfully schmaltzy vaudeville routines and this production’s hands-down highlight, “You Gotta Get a Gimmick,” in which three burlesque vets pull out all the stops. Less successful is the climactic number, “Rose’s Turn,” the musical-theater equivalent of King Lear raging on the heath. Blackhurst displays flawless technical command—but then, the middle of a nervous breakdown is precisely when we should see some chinks in the rhinestone-studded armor." "... The biggest achievement, however, is Martin Andrew’s set design, featuring a giant spinning proscenium that efficiently transitions between the offstage and onstage worlds in this showbiz inspired musical. I’ve seen some Gypsys get mired down in the numerous scene changes —not this production. The evening clips along at a nice pace, but, as a result, skims over the more complex emotional moments that separate a good Gypsy from a brilliant Gypsy." 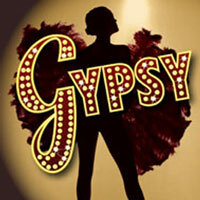 "...Gypsy is a classic back stage story of vaudeville and of a mother’s living her life through her children. It is also about the rise of Gypsy Rose Lee, the famed stripper. Drury Lane Theatre’s production is certainly worth seeing since Klea Blackhurst’s dreams get us ‘entertained.’"
"...The musical itself is still a model of entertainment and proficiency. In the title role, Andrea Prestinario is a bit too elegant to be completely convincing in shy and awkward Louise's transformation into burlesque superstar Gypsy Rose Lee, but she is a beautiful singer. And Matthew Crowle turns in an electrifying dance solo in "All I Need is the Girl". There are no sparks at all between Rose and Herbie (a very dry David Kortemeier). So Rose's disregard for conformity and marital domesticity can at least be understood. At its best, this production pays tribute to a great American musical that may entertain but hardly inspire." "... It is difficult to believe that it is over 50 years since “Gypsy”, the story of Gypsy Rose Lee became an award winning Broadway musical, and yet, in its newest inception on the stage at Drury Lane Oakbrook, it is as fresh as one could hope for. The only reason, that this marvelous production doesn’y get a “must see” is that the director ( William Ostek) didn’t have enough creativity in his work. Choreographer Tammy Mader, for the most part followed the original dance, but made some modifications that showed in the finished product.The sizzling transition from little kids to teens is stunning, but be warned, they do use a strobe light to create this special effect! The sets ( Martin Andrew) while workable were not what we are used to at Drury Lane, with very little glitz and glamour." "...With all these set changes, the scenery necessarily really does look like scenery until it’s hard to tell the real-life settings from Rose’s improvised backdrops. That might be a problem is what’s up front wasn’t so special, like Matthew Crowle’s awesome semi-solo as dance-happy Tulsa crooning how “All I Really Need Is The Girl” or the never-more-hilarious trio “You’ve Gotta Get a Gimmick.” That too-brief song and dance–and yes, even the novelty number with a trumpet, lights and pasties–remind us exactly why we sit in our seats or, more importantly, don’t: Everything’s coming up “Gypsy!”"